1981-06-01. Good. Ships with Tracking Number! INTERNATIONAL WORLDWIDE Shipping available. May not contain Access Codes or Supplements. May be ex-library. Shipping & Handling by region. Buy with confidence, excellent customer service! 1992-03-30. Good. Ships with Tracking Number! INTERNATIONAL WORLDWIDE Shipping available. May not contain Access Codes or Supplements. May be ex-library. Shipping & Handling by region. Buy with confidence, excellent customer service! New York: Arbor House, 1976. Cloth and boards. First edition. Signed by the author. About fine in dust jacket. THE EDUCATION OF PATRICK SILVER. New York:: Arbor House,, (1976). Very near fine in a like dustjacket (a bit of toning to the rear cover of the dj) . First printing. The third book in his "crime and punishment" trilogy (which actually became a quartet) featuring Patrick Silver, defrocked cop, ex-colleague and now antagonist to Isaac Slidel, NY Deputy Police Commissioner. INSCRIBED on the title page to the Oklahoma book collector Larry Owens and dated in 1995. 184 pp. NY: Arbor House, (1976).. First edition.. 184 pp. Near fine in near fine dust jacket with a scratch to rear panel. Promotional flyer laid in. NY: Arbor House. 1976. Advance Uncorrected Proof. Very Good in wrappers. First Edition. Softcover. Very Good. NY: Arbor House. (1976). The uncorrected proof copy. Near fine in wrappers and very good proof dust jacket. First Edition. Softcover. Near Fine. Arbor House, 1976-01-01. 1st. Hardcover. Used:Good. New York. 1976. Arbor House. 1st American Edition. Very Good In Slightly Worn Dustjacket. ISBN:087795142x. 184 pages. hardcover. Jacket design by Loretta Trezzo. FROM THE PUBLISHER - Here is the capstone to Jerome Charyns contemporary brilliantly conceived crime-and-punishment trilogy (Time) begun with BLUE EYES and continued with MARILYN THE WILD - together building a cosmos of big city folks placed high and low, in hot pursuit of life in extremis. wonderful, terrible, true. At the center is Patrick Silver, defrocked cop, ex-colleague and now antagonist of Isaac Sidel, the First Deputy Police Commissioner of New York, also known as the Blue Godfather Patrick Silvers present beat is an Irish synogogue, his enemies are fearsome, his constituents are suspicious, his love and just reward, finally, is Odile Leonhardy, a teen-age sorceress whose office is the Plaza, whose favors are a blessing. Crime-punishment-reward form the education of Patrick Silver, and the trilogy of Jerome Charyns extraordinary achievement. inventory #13194 ISBN: 087795142x. New York. 1976. Arbor House. 1st American Edition. Very Good In Slightly Worn Dustjacket. ISBN:087795142x. 184 pages. hardcover. Jacket design by Loretta Trezzo. FROM THE PUBLISHER - Here is the capstone to Jerome Charyns contemporary brilliantly conceived crime-and-punishment trilogy (Time) begun with BLUE EYES and continued with MARILYN THE WILD - together building a cosmos of big city folks placed high and low, in hot pursuit of life in extremis. wonderful, terrible, true. At the center is Patrick Silver, defrocked cop, ex-colleague and now antagonist of Isaac Sidel, the First Deputy Police Commissioner of New York, also known as the Blue Godfather Patrick Silvers present beat is an Irish synogogue, his enemies are fearsome, his constituents are suspicious, his love and just reward, finally, is Odile Leonhardy, a teen-age sorceress whose office is the Plaza, whose favors are a blessing. Crime-punishment-reward form the education of Patrick Silver, and the trilogy of Jerome Charyns extraordinary achievement. inventory #1671 ISBN: 087795142x. New York. 1978. October 1978. Arbor House. 1st Edition. Very Good In Dustjacket. ISBN:0877951969. 315 pages. hardcover. Jacket design by Paul Bacon. 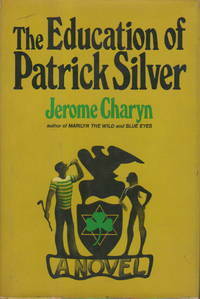 FROM THE PUBLISHER - Beginning with BLUE EYES, and continuing with MARILYN THE WILD and THE EDUCATION OF PATRICK SILVER, Jerome Charyn developed a true American original, Isaac Sidel, First Deputy Police Commissioner of New York City - of Big City Anywhere, America, really - a wounded romantic whose heart is ravaged by too much love for his fellow lesser-man, whose guts are on fire with too much rage at the well-placed killers of his Citys dreams. Now in SECRET ISAAC Mr. Charyn (about whose most recent novel John Leonard in The New York Times said, Its as if The Sound and the fury had been written by Candide) allows the reader to discover the essential Isaac, the secret Isaac, trailing him from New York Citys political halls and lower depths to Dublins Joycean underworld as he pursues villainy, true love and terrible revenge, and along the way creates a masterwork. inventory #1673 ISBN: 0877951969. Arbor House, 1976. Hardcover. Good. NY: Arbor House. Hardcover. 087795142X VG-GOOD in Dust Jacket with rear panel soiling. . Fair. 1976. First Edition. Arbor House, 1976. First. Hardbound. nearly fine with nice bright d.j.. 184 pp. Condition: nearly fine with nice bright d.j. New York: Arbor. Very Good. 1976. First Edition. Hardcover. 087795142x . Torn . HARPER COLLINS TRADE DIVISION. GOOD CONDITION. HARDCOVER W/JACKET. NY: Arbor. Hardcover. Near fine in Dust Jacket. . Very Good. 1976. First Edition. London, United Kingdom: Bloomsbury Publishing PLC. Soft cover. 0747510091 Unstated First Edition, First Printing (numberline), 1992. Bloomsbury Publishing, London. Printed in Great Britain. Not a former library book, no jacket, not a remainder, Soft cover. Cover shows some shelf wear, rubbing, bumped and lightly tattered edges/corners. Light indentations leftover from erased pencil markings on first page, very minimal. Clean inside pages and page edges. Overall Good+ Condition. Top New York cop Isaac Sidel had been born into this world to plague the Guzmanns, a tribe of Peruvian pimps who operated out of the Bronx and a phone box on 8th Street in Manhattan. Isaac's target now was the simple-minded Jeronimo, known as 'the baby', but Papa Guzmann had put his son under protection of an ex-cop called Patrick Silver - a crazy Irish bodyguard who lived in the basement of a synagogue and never wore shoes, not even in winter. All books shipped within 24 hours with U.S. Postal Service Delivery Confirmation, each order is packaged in a new box with bubble wrap, and always your satisfaction is guaranteed. . Good. 1992. 1st Edition. Avon. Used - Very Good. Very Good condition. NY: Arbor House, 1976. First edition. Hardcover. Very Good +/Very good +. The third Police Commissioner Silver novel. Small board corner bump. Dust jacket has tiny tear & small crease on back panel. London: Bloomsbury, 1992. Clean and bright with no inscriptions. 152 pages.. First Thus. Very Good/No Jacket. 5" x 7.5". Softback. HarperCollins Publishers, 1976. Hardcover. Very Good. Disclaimer:A copy that has been read, but remains in excellent condition. Pages are intact and are not marred by notes or highlighting, but may contain a neat previous owner name. The spine remains undamaged. At ThriftBooks, our motto is: Read More, Spend Less.Dust jacket quality is not guaranteed. HarperCollins Publishers, 1977. Mass Market Paperback. Good. Disclaimer:A copy that has been read, but remains in clean condition. All pages are intact, and the cover is intact. The spine may show signs of wear. Pages can include limited notes and highlighting, and the copy can include previous owner inscriptions. The dust jacket is missing. At ThriftBooks, our motto is: Read More, Spend Less. Avon, June 1981. Paperback. Good - Trade. Stock photos may not look exactly like the book. New York, NY, U.S.A.: Avon / Bard, 1981. Bookstore stamp on first page, otherwise pages are clean and binding is tight.. Mass Market Paperback. Spine Somewhat Cocked. Armada, 1977. Paperback. Book Condition: Good. Moderate reading wear. Very clean interior..